While watching Aki’s exuberant dash about this snowy meadow I wonder at how little we understand each other. She reads smells; I English. Still she has trained me to take her to these white open spaces with repeated displays of apparent happiness—-leaps that end in a shoulder plant leading to a long surface slide then the burying of her doggy face in the snow. This always brings a smile to my human face. Today I look for signs of the resurrection that is spring; she for clues left by those who have gone before. She has better chance of success. Fog still softens the near horizon of the Peterson Salt Chuck leaving me with a view of snow retreating from brown dead grass lands. The snow, which with its brother ice brought on the near death of autumn, now takes away the only clues of light and life on it retreat from the sky’s new warmth. Nothing here speaks of Easter, a holiday scheduled too early in the year for Northern places. We are not alone. 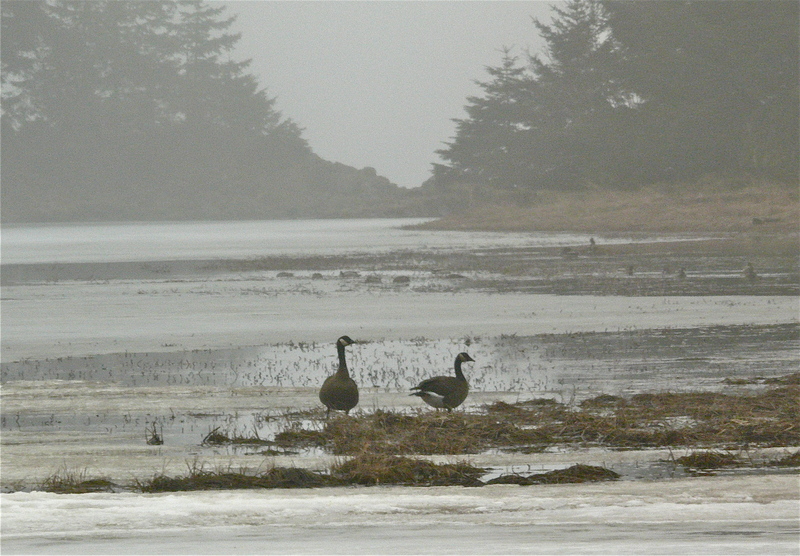 There are Canada Geese feeding along a salt chuck edge just exposed by melting ice. They hold their ground apparently aware that we cannot cross the crumbing barrier of ice between them and us. We hear their grumbling long after passing out of their view. 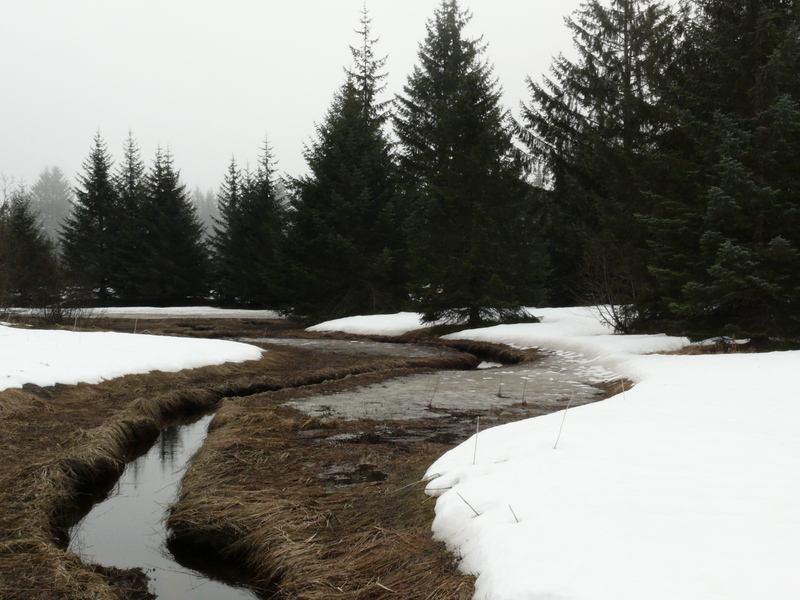 Islands of good sized spruce trees dot the meadow, each offering bare firm ground on which to walk, a welcome relief from the softening meadow snow. Most hold their health but the bark of one tree has almost been removed by porcupines. (An unfortunately tasty victim or willing sacrifice?). Just past this island Aki dashes ahead. A small dark thing moves across my path at incredible speed. Was this blur a Pine Martin or an evil spirit flushed from sleep by snow melt? Aki puts me at ease on her return, dashing along the same route of the dark presence. Although sometimes she appears to see ghosts, her actions here are those of a dog following freshly laid scent. This entry was posted in Uncategorized on March 31, 2013 by Dan Branch. We’ve been sent to this rainforest trail on a mission: sever and bring home three blue berry branches—-each the red color of spring, each supporting swelling flower buds. I carry a mercifully sharp knife to do the deed. Aki, a fan of the ripe blueberry refuses to help. She knows, as I do, that while the plants wounded by my hand will survive their severed limbs will never bear fruit. They pay the price for our indulgence; our need to watch their tiny blossoms, each a miniature Japanese lantern open during Easter dinner. 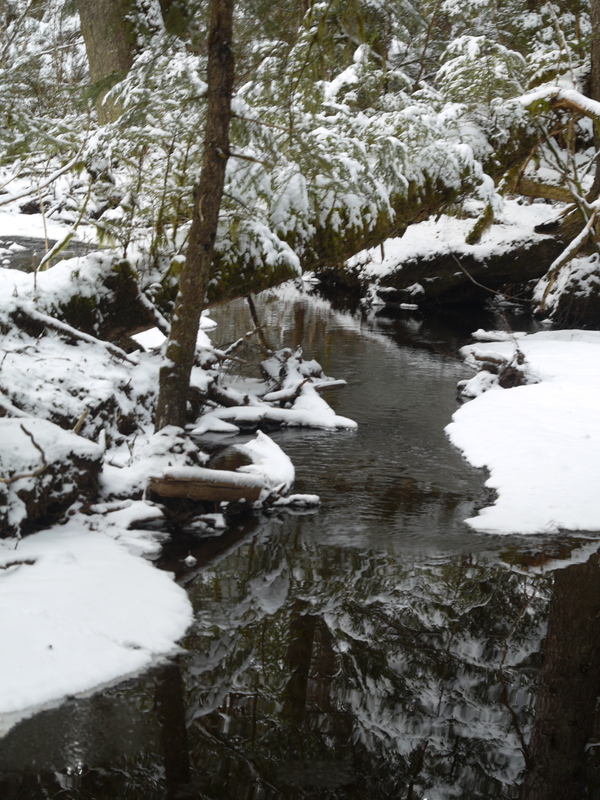 The rain returned last night to wash away much of winter’s snow from the trails. Little bags of rains hang from the blue berry brush, each a misshapen globe of light. With rain hammering my parka hood I can barely hear an eagle complain in the trail side spruce or the percussive rhythms of a woodpecker’s drilling for food. 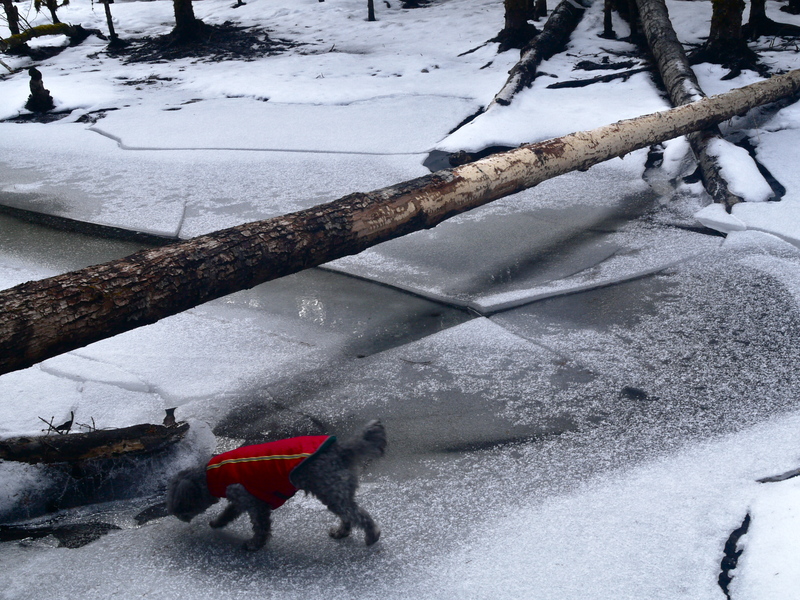 Still, the deluge has freed the trail boards of ice and infused them with a lovely if weak glimmer. 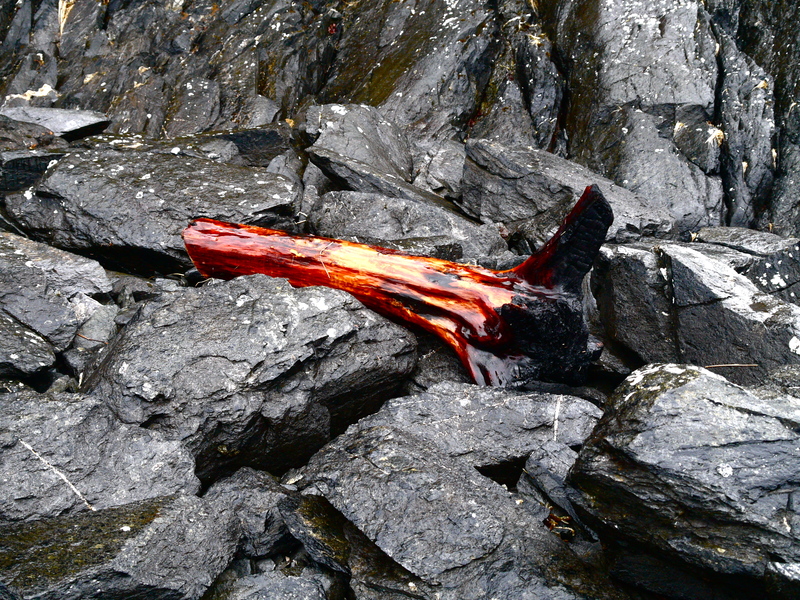 There’s beauty here—-shinning trails and bags of rain, melting ice still encasing thin roots of an tumbled tree, this motif delivered by the tide—curves of a partially burned root providing counterpoint for the angular interplay of glowing gray cliff rocks. 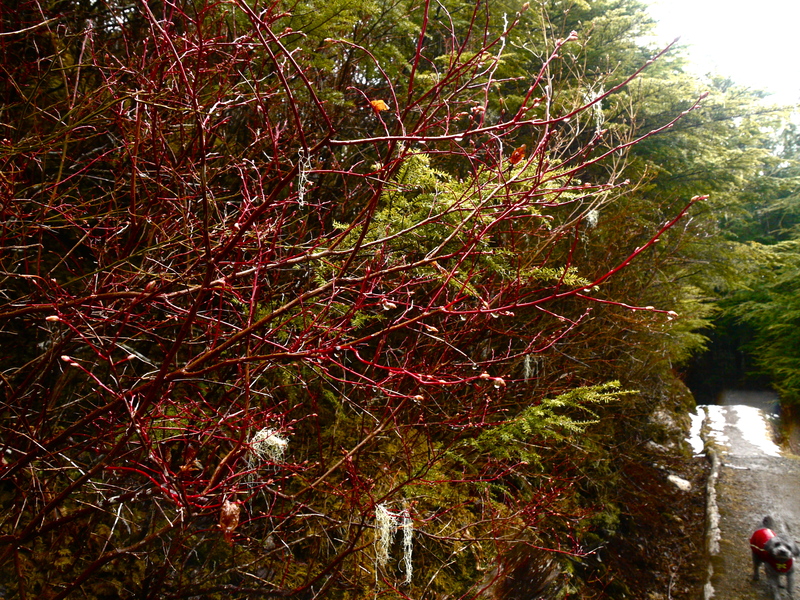 This entry was posted in Aki, Dan Branch, Juneau, Kwethluk, Nature, Southeast Alaska on March 30, 2013 by Dan Branch. The calendar claims that Spring waits outside our door but snow still covers the moraine and ice the beaver ponds. Wrapping Aki in her red fleece coat I grab the skis and head to the glacier. We find a good surface for traveling but no dogs for Aki to greet. She hides her disappointment in a search for clues left by recent visitors and, when we reach their village, the beavers. Someone has dismantled their large dam, replacing their miniature hockey rink with a sad scene—-mud, fractured pond ice,fallen cottonwoods. We can’t find beaver tracks in the softening snow. Aki heads deeper into their village until I call her back. No sense adding to their stress. Returning to the main trail we find tracks resembling those left by very large bare human feet but with deformed big toes. These are deep, crisp impressions in the snow with icy sides and bottoms as if made in the heat of the day by something of great bulk. We find them where the trail bisects a grove of trees killed years ago by beaver formed floods. I look around for someone to confirm our find but Mt. McGinnis, with sun in his eyes is the only other presence. Do I credit it a hoax or confirmation of Big Foot? Wanting a return to firmer ground I lead Aki further into the moraine and then to Mendenhall Lake and a view of it’s glacier dropping out of the clouds. 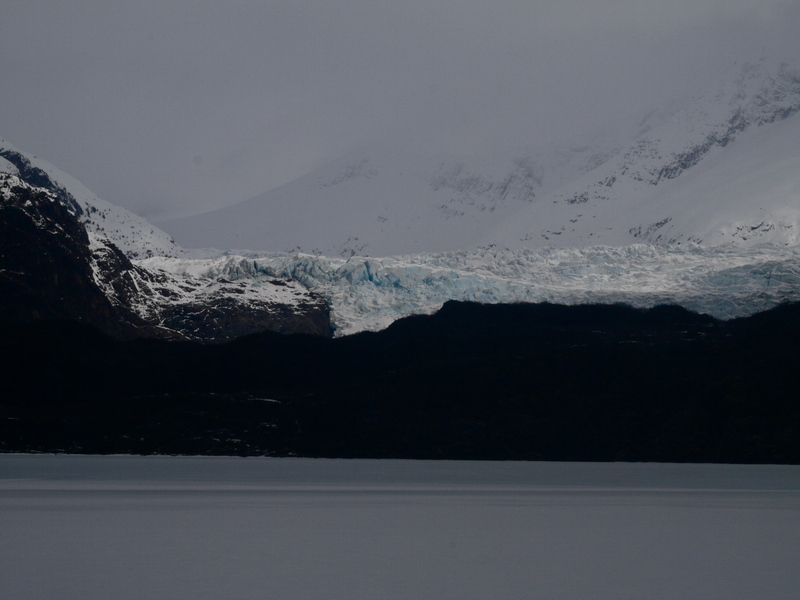 A shaft of light fights its way through the cloud cover to hit a portion of the ice fall, now a translucent light blue under the sudden illumination. This is something man can not duplicate or distort to legend—at least not yet. 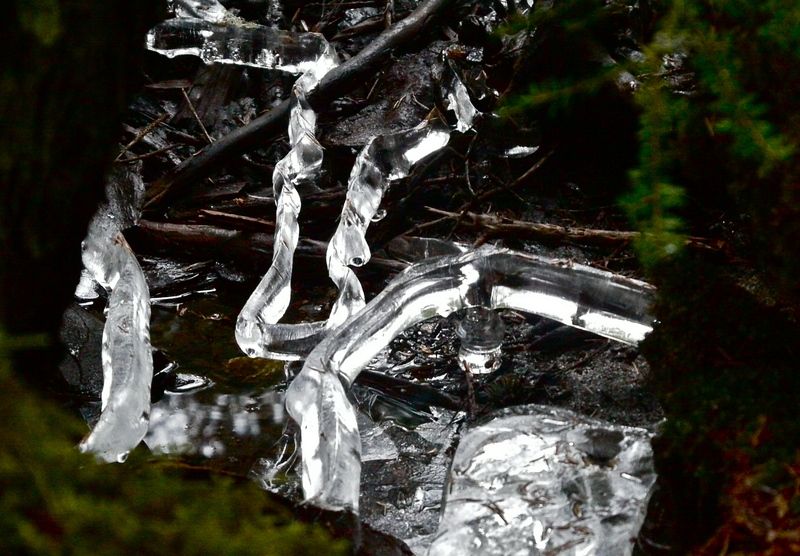 This entry was posted in Aki, Beavers, Dan Branch, glacier moraine, Juneau, Nature, Southeast Alaska on March 27, 2013 by Dan Branch. This morning we heard the frantic sound of 10 or 12 dog teams being readied for a race. It has been many years since we last hitched up dogs to a sled but the sights and sounds then and now are much the same—crazy canine eyes offering no recognition of anyone but their musher, high pitched yelps—some in silo—others in harmony, the springing leap ending in a lunge of frustration. The first and perhaps strongest team approaches the starting line, here a path between aspens; musher crushing the sled brake into snow while handlers spaced evenly among the team struggle to control the dogs. While the next team approaches the staging area, a race official releases the dogs with a nod of head. The second team must watch, constrained by men for two minutes, haunted by memories of the just released disappearing around a bend. 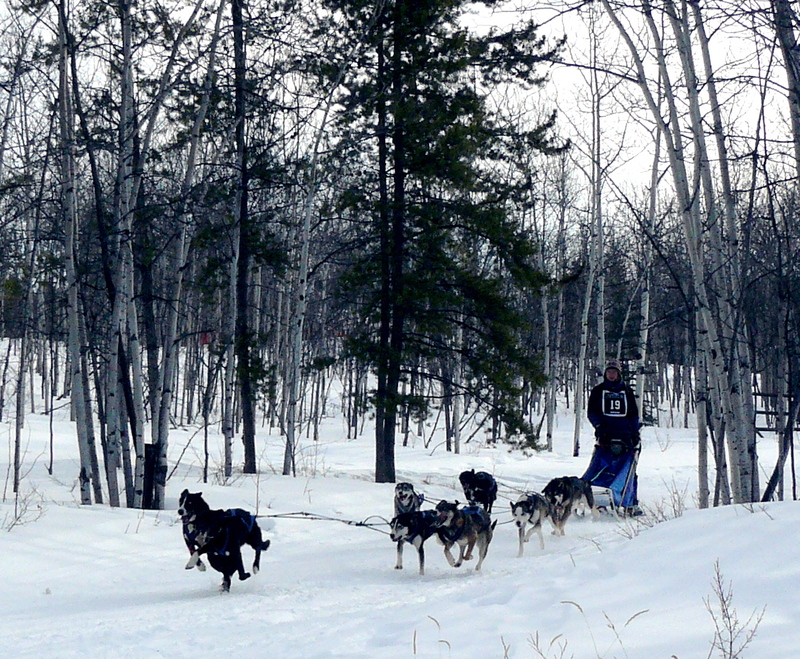 When we ran dogs this was the magic moment— the released dogs powering forward, almost snapping the sled from your hands. So intent are you in controlling the sled you don’t notice for a second silent replacing pandemonium. This entry was posted in Dan Branch, Dog Mushing, Kwethluk, Nature, Yukon on March 24, 2013 by Dan Branch. Winter hangs here on the Yukon River but, if the weatherman can be believed, it will soon be pushed upriver by spring. Perhaps that is why we have this beautiful cross country ski complex to ourselves. The sun breaks through filmy overcast but brings wind rather than warmth. It’s a rolling trail and we look forward to hill climbs in hope that heat generated by effort will thaw our faces and fingers. It works but wind chill built up during the following descent removes returns us back to zero. 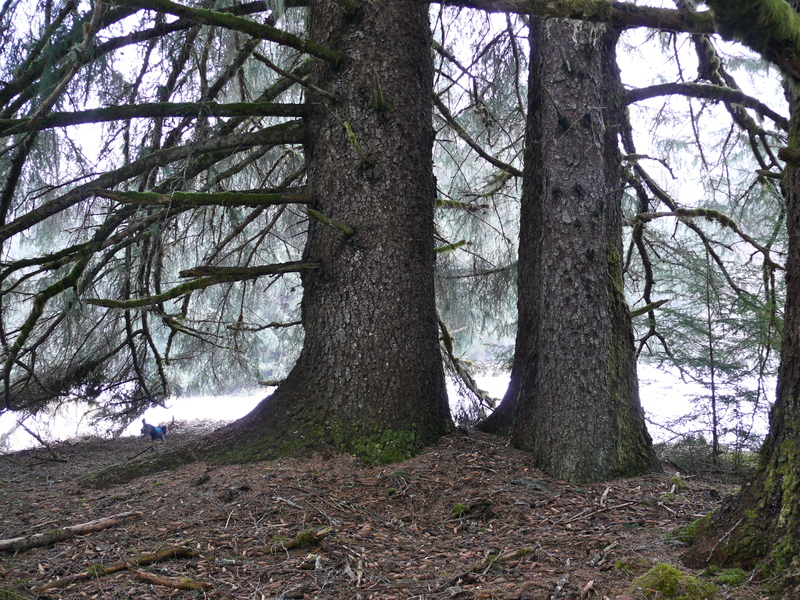 We return to the car on a sheltered forest trail lined with scrubby spruce and stately aspen, the beauty of both brought out by dappling sun. An enormous train of dogs, adults and children begins to pass us, lead by two large jowled hounds. A tired father dragging along a trailer sled loaded with twins brings up the rear. 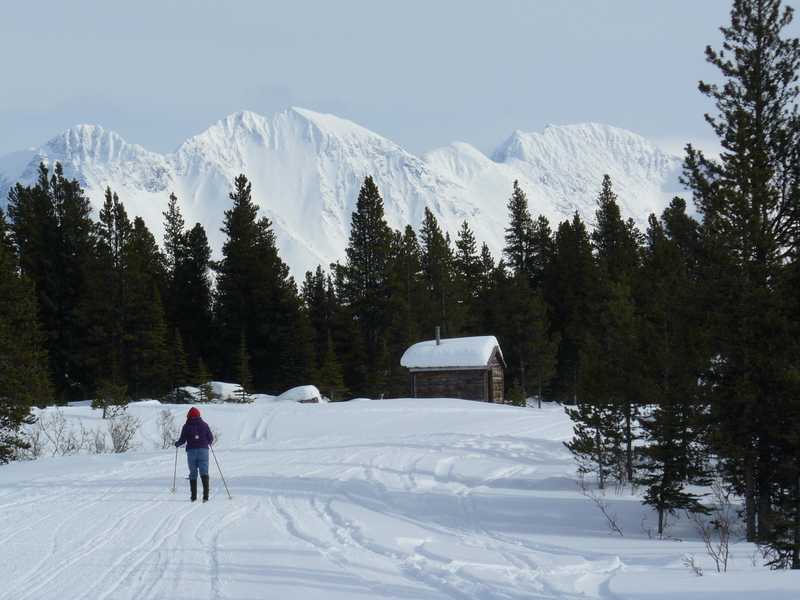 This entry was posted in Dan Branch, Nature, Yukon on March 23, 2013 by Dan Branch. Skiing over these Yukon and White Pass Rail tracks is easy since they are covered with several feet of snow. It’s cold here at the interior end of the Chilkoot Trail, plus 5 F, but isn’t uncomfortable until the wind blows up the line. 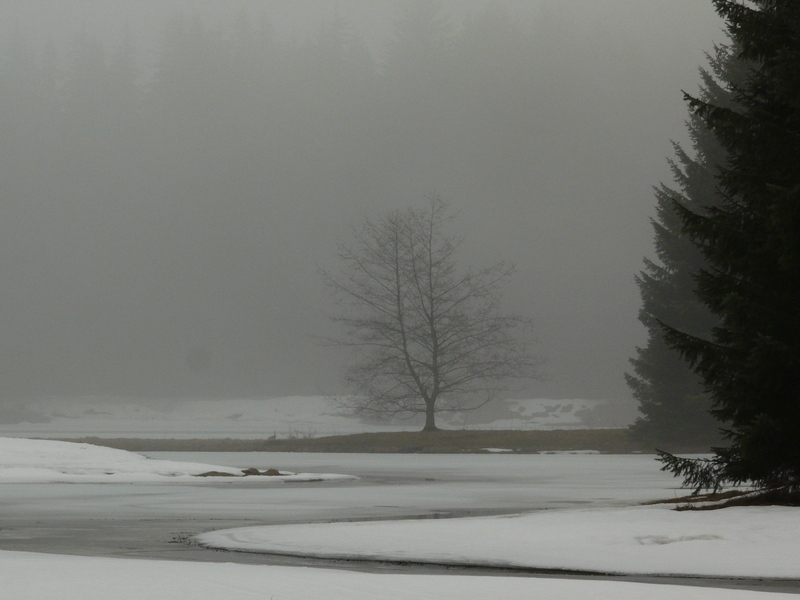 When the sun breaks through a thin cloud layer the greens, whites and grays of the forest wake up. A quiet place most of the winter (recent wild things tracks confirm) it must brace itself for tomorrow’s cross country ski race. Even now volunteers construct an aid station, Inuit style, from snow blocks but shaped like a pirate ship—skull shaped prow, beetle killed lodge pine masts and booms, Jolly Roger flags festooning the rigging. What must the coyote think-the one that left such purposeful tracks in this now sparkling snow? 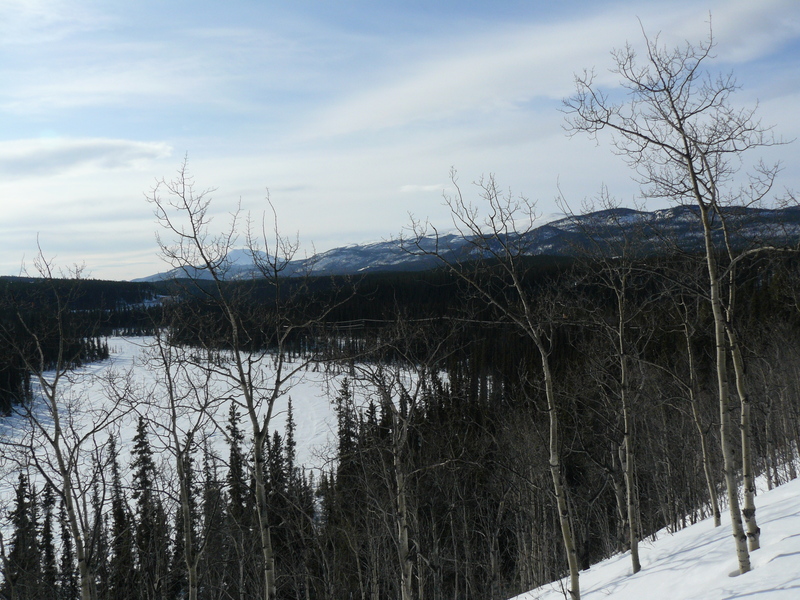 This entry was posted in Dan Branch, Nature, Yukon on March 22, 2013 by Dan Branch. St. Patrick’s Day means nothing to Aki. She is only interested in the animal moving with stealth through the woods lining this beach. We are far from the bars where most Americans like to celebrate the saint’s holiday, drinking green colored Budweisers and singing songs not heard in Ireland since it was a British colony. You might find someone there with a Bodhran but no one with a copy of Patrick’s breastplate. Americans have always howled at the moon this time of year—the Irishman’s saint’s day is just an excuse. My eyes settle on a wooded hill forming a bell curve across Stephen’s Passage. 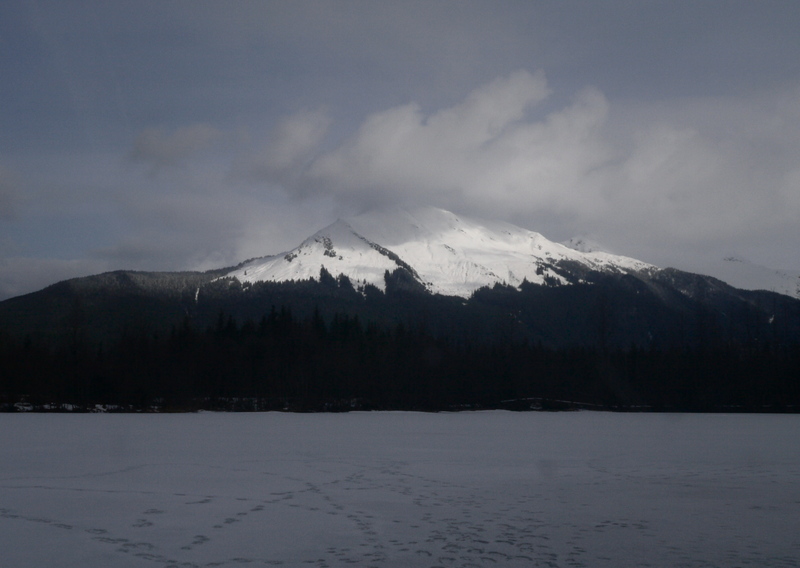 It’s shape might have reminded the Irish crew on Vancouver’s Discovery of Croagh Patrick. A homesick man looks for the familiar in the foreign; perhaps they imagined climbing this mountain without shoes. We have had our pilgrimage this morning—me in boots not bare feet like Aki—the little zealot. 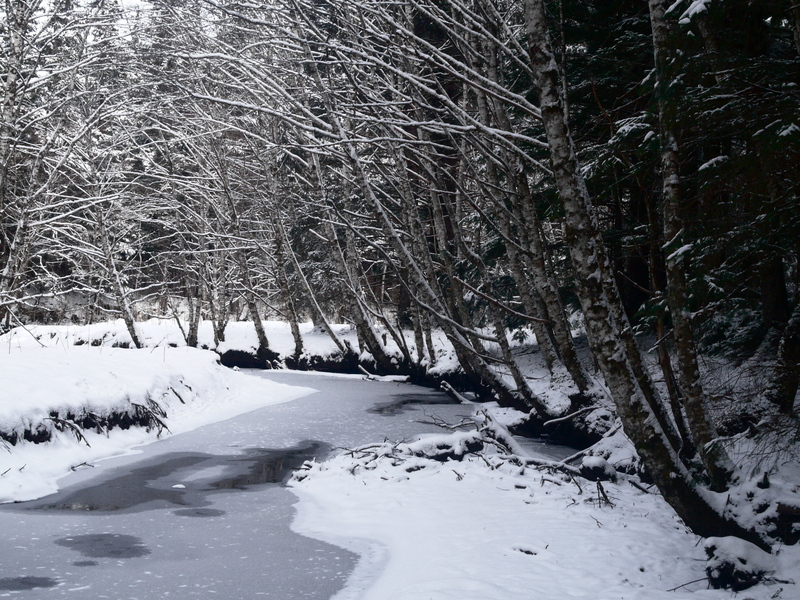 Together we wandered half lost through a thick forest drained by an awakening creek. Snow still frosted trees, bush, and ground. Without a mountain summit to draw us on we chose the easiest paths until reaching a throne-shaped tree stump illuminated by a tiny shaft of sunlight shining through the overcast. Giving this troll’s royal chair a slight nod, I lead Aki out of the woods and onto this beach to take up station on a rock just washed clean of snow by the tide. Now we wait for sun to warm out faces or a whale to breach in Stephen’s Passage, or a line of Trolls to begin the climb up Croagh Patrick. 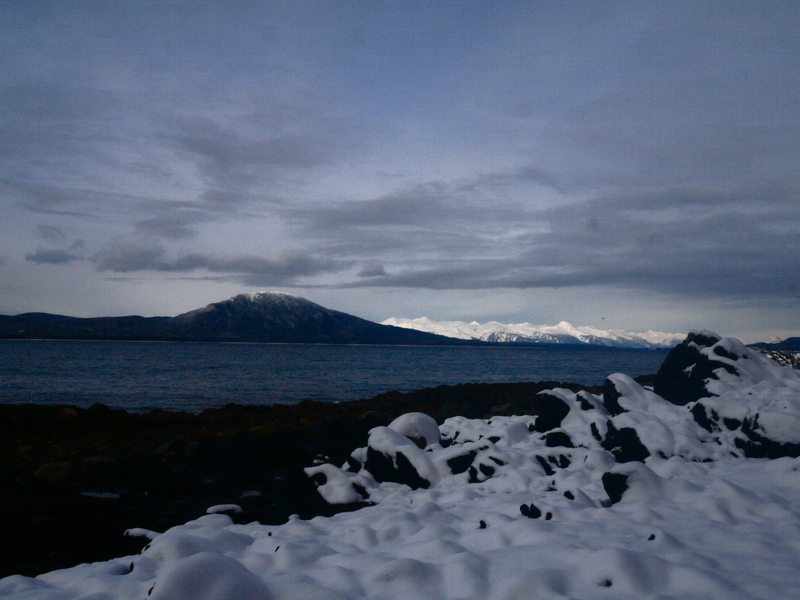 This entry was posted in Aki, Dan Branch, Juneau, Nature, Southeast Alaska on March 17, 2013 by Dan Branch.